Come for the time travel, stay for the plot line. This book is 849 pages of pure historical "what if" bliss. A well-researched gem from a pop-icon writing about a modern myth and legend in itself: JFK's assassination. It's deep stuff, but King approaches it with such deft that it feels like it was the easiest thing he's ever written. This I know cannot be true, especially when he mentions a pile a books in the afterward and how they are his height, all dealing with research involving JFK, Lee Harvey Oswald and the like. If King were to stop his writing career now, he would be ending on such a high note -- even the New York Times was in love with this book. We find out that our hero, Jake Epping, learns about a portal, a bubble really, that allows anyone to walk through it and take a trip to 1958. He learns this from a diner-owner named Al. Al wanted to save JFK from getting assassinated, but comes back dying of lung cancer and puts the task into Jake's hand. Before Jake decides to take on such a task, he first goes back in time to save a child from getting severely beaten by his father, to test this whole time-travel phenomenon. He learns about this beating from an essay he receives from one of his GED students, a janitor at the school where Jake teaches who is slightly crippled. Once Jake gets his hands dirty and saves the janitor from ever receiving a beating, he comes back to the present to see what the present looks like after he has messed with the past. He, then, takes on the task of trying to change history again (re-saving the janitor, again, too) by saving JFK's life, and the reader is thrown into an amazing tale. 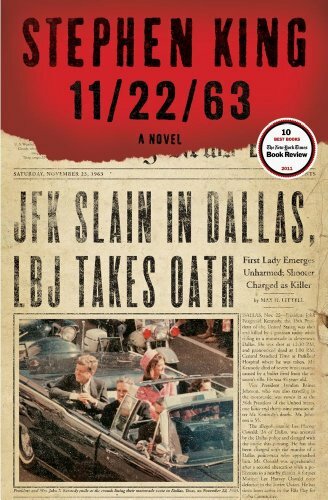 But since Jake is transported back to 1958, and JFK wasn't killed until November of 1963, (and Lee Harvey Oswald doesn't show up until half-way through the book) Jake's got a lot of time to kill. So, he lives in the past as George Amberson. That's a lot of time, but King isn't just treading water, because the story becomes even more addicting when Jake Epping, now known as George Amberson, moves to the small town of Jodie Texas and becomes a member of the small town that is reminiscent of "Friday Night Lights." He subs at the high school, becomes friends with the locals and falls in love with the new librarian, Sadie. Sadie is running from a past she is ashamed of (nothing horror-story, King keeps it simple) and you start rooting Jake (George) and Sadie on. The life Jake creates in Jodie, Texas becomes enmeshed with his secret life of spying on Lee Harvey Oswald, and from page 400-on, you won't be able to put the book down. King is tackling some major themes, here. Love and time and loss, while answering the question: What happens if you can change the past, and what repercussions does it have on the present? This story has so much heart, that yours will start beating harder. This story is so deep, so big, so broad and so true.